Situated only 10 minutes from Brisbane International Airport the Best Western Airport 85 Motel provides a wide variety of hotel accommodation that has been well appointed to suit the needs of all types of travellers. With Free car parking and free continental breakfast every morning the Best Western Airport 85 Motel is a great place to stay. 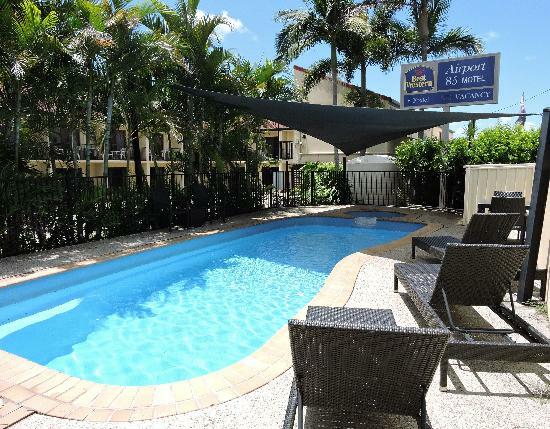 Conveniently located ten minutes from Boondall Entertainment Centre and 2 minutes walk from Doomben and Eagle Farm racecourses the Best Western Airport 85 Motel Brisbane has everything that you will need at your fingertips. With a range of hotel accommodation, friendly service and a great location in Brisbane the Best Western Airport 85 Motel is the perfect place to stay for both business and holiday travellers. This affordable property also has lots of great facilities including direct internet access, free car parking, guest laundry, restaurant, outdoor swimming pool, tour desk, bbq, airport shuttle and daily housekeeping. The Best Western Airport 85 Motel, Brisbane caters for corporate travellers with WIFI throughout the entire hotel and in all of the hotel rooms. The Best Western Airport 85 Motel provides superior customer service in a convenient location near Brisbane International Airport. 2 Room Hotel Suite : Sleeps up to 7 guests on 1 Queen Bed & 4 Single Beds or 2 Queen Beds & 4 Single Beds. Family Hotel Room : Sleeps up to 5 guests on 1 Queen & 2 Singles or 1 Queen, 1 Bunk Bed & 1 Trundle Bed. Queen Hotel Room : Sleeps up to 2 guests on 1 Queen Bed. Twin Hotel Room : Sleeps up to 2 guests on 2 Single Beds or 1 Queen Bed & 1 Single Bed. Twin/Triple Hotel Room : Sleeps up to 3 guests on 1 Queen Bed & 1 Single Bed or 3 Singles Beds.